Check Out The New Red Band Trailer for “Your Highness”!!! 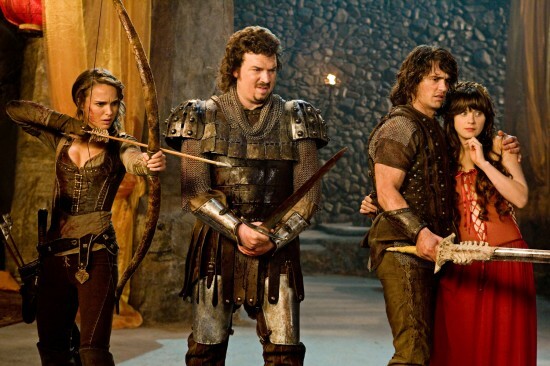 We are only a few days away from the April 8th release of the stoner comedy, “Your Highness” starring Danny McBride, James Franco, and Natalie Portman. The studio has given us a brand new red band trailer for our enjoyment. There needs to be more pot smoking comedies that have wizards and knights, and sorcery. Just sayin’. Red Band Trailer for “Your Highness” Hits The Web and Makes My Sides Split!! This entry was posted on Friday, March 25th, 2011 at 1:44 pm	and is filed under Film, News. You can follow any responses to this entry through the RSS 2.0 feed. You can skip to the end and leave a response. Pinging is currently not allowed. « COMIC BOOK RELEASES FOR THE 4TH WEEK OF MARCH!! !